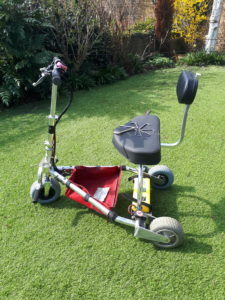 Cherished Travelscoot is for sale. I bought the new model TravelScoot in 2014 and it still provides excellent service; I use it regularly. It has reverse gear. The brake locks on the handles bars are in full working order and the brakes are recently adjusted. I have replaced the Velcro strips on the red caddy. It also has a ‘ding-a-ling’ bicycle bell and there is a full set of Allen keys. A 274.4 Wh Lithium Ion battery purchased in 2016 is included; it is about 50% used. I have recently used it on a 4 mile journey and the power lights indicated less than half the energy had been used. An almost new battery charger is also included. 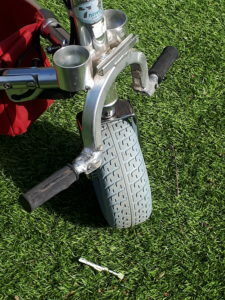 The purchaser needs to be aware that the handlebars cannot be fully pushed down. Removing the seat and U-Arc from the base unit is a bit of a knack. The folding foot pedals are safely and securely welded into place following damage by airport baggage handlers in September 2018. More details are available in posts at the end of this article. The selling price is £ 1,500. The purchaser must collect the Travelscoot. The owner lives in Berkhamsted, Southwest Herts. 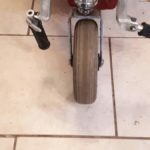 Baggage handlers damaged the much cherished TravelScoot, frequently called ‘The Trike’, in September 2018 when on holiday in Australia. I received compensation from the airline so this allowed me to buy a replacement one.